The Cambridge Biomedical Campus, located at the southern end of Hills Road on the southern edge of Cambridge, England, is one of the largest centres of health science and medical research in the world and the largest such centre in Europe. Managed by the University of Cambridge, the site is funded by organisations such as the Cambridge University Hospitals NHS Foundation Trust, the Wellcome Trust, Cancer Research UK, the UK government's Medical Research Council and has National Institute for Health Research Biomedical Research Centre status. It is an accredited UK academic health science centre (Cambridge University Health Partners) and home to Addenbrooke's Hospital and the university's medical school. The Cambridge Biomedical Campus is home to the following institutes. Addenbrooke's Hospital viewed from the south. 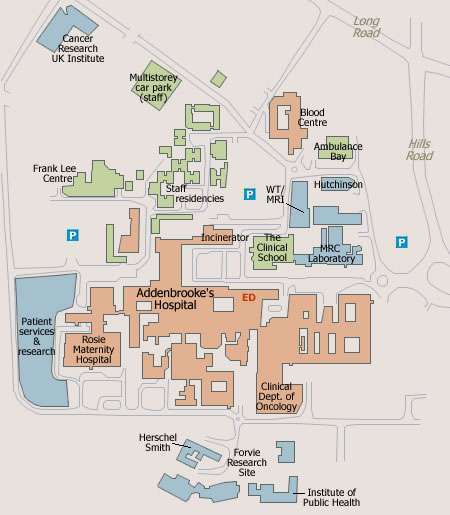 Addenbrooke's Hopital is a large teaching hospital, and the central focus of the campus. Papworth Hospital is due to move to new premises on the Cambridge Biomedical Campus in 2018. AstraZeneca’s global research and development facility is due to be based on the campus and will house a workforce of approximately 2,000 individuals. It will be home to both early and late-stage medicines discovery and development, and cover both small molecules and biologics. Research activities will span all preclinical functional groups, including antibody engineering, medicinal chemistry and high throughput screening. The University of Cambridge Medical School, established in 1976. The LMB is a molecular biology research institute funded by the UK Medical Research Council. 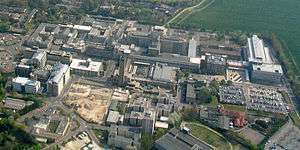 It was founded in Cambridge in 1947 as the Unit for Research on the Molecular Structure of Biological Systems and moved to a site adjacent to Addenbrooke's Hospital in 1962. A 27,000m2 replacement building close to the previous site was completed in 2012 and opened in May 2013. The laboratory has won nine Nobel Prizes including the 1962 prize (Physiology or Medicine) awarded for the discovery of the double-helix structure of DNA. The Wellcome Trust-Medical Research Council Cambridge Stem Cell Institute or 'SCI' is a virtual organisation composed of the Anne McLaren Laboratory for Stem Cell Biology and Regenerative Medicine and the Wellcome Trust Centre for Stem Cell Research, as well as University-based Principal Investigators working in neighbouring Cambridge institutes whose research is primarily focused on stem cell biology and/or translation. The SCI is principally funded by the Wellcome Trust and the Medical Research Council. The Wellcome Trust also funds the SCI's internationally competitive 4-Year PhD Programme in Stem Cell Biology and Medicine. Stem cell biology and regenerative medicine research is a designated University of Cambridge Strategic Initiative. To nurture future generations of stem cell scientists and clinical investigators in an intellectually invigorating mix of basic and translational research. The SCI was formed in 2012 following an £8m investment by the Wellcome Trust and the Medical Research Council. The SCI will eventually be housed in a purpose-built 8000m2 facility to be constructed on the Cambridge Biomedical Campus site. The Cancer Research UK Cambridge Institute (CRUK-CI) is principally funded by Cancer Research UK and the University of Cambridge and is a major member institute of the Cambridge Cancer Centre, a virtual organisation of Cambridge researchers whose work has current or potential application to cancer research. The Institute offers highly competitive PhD programmes; both studentships and clinical research training fellowships (for aspiring clinical academics), attracting applicants from the UK and around the world. Cancer research is a designated University of Cambridge Strategic Initiative. Basic research, which involves looking into the cellular and molecular biology of cancer. Research into molecular imaging, genomics, bioinformatics and biomolecular modeling. Research that focuses on specific cancer sites, forming a bridge between the clinical and laboratory areas. Clinical investigations and trials, including population based studies into screening and prevention. The centre was officially opened by Queen Elizabeth II in February 2007. The CIMR is a cross-departmental institute in the University of Cambridge, receiving funding from the Wellcome Trust. Research is focused on four main areas: misfolded proteins and disease, intracellular membrane traffic, autoimmune disease and haematopoietic stem cell biology. The Wolfson Brain Imaging Centre was created in 1995 to develop and apply advanced imaging methods to patients with traumatic brain injury. It is unique in being co-located with the Neurosciences Critical Care Unit of Addenbrooke's Hospital. Since its establishment it has become an internationally leading Positron Emission Tomography and Magnetic Resonance Imaging centre. 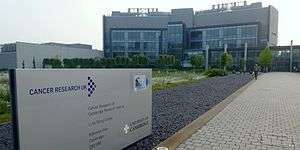 The Hutchison/MRC Research Centre is a cancer research centre housing researchers from the University of Cambridge Department of Oncology, the MRC Cancer Cell Unit, and the University of Cambridge "Cambridge Molecular Therapeutics Programme". The Hutchison/MRC Research Centre is a member institute of the Cambridge Cancer Centre, a virtual organisation of Cambridge researchers whose work has current or potential application to cancer research. The Rosie Hospital is Cambridge's first purpose-built maternity hospital, opened in October 1983. A multimillion-pound extension of the Rosie Hospital was completed in 2012. The MRC Mitochondrial Biology Unit is funded by the Medical Research Council and is focused on research to understand mitochondrial process and their involvement in human diseases. It is co-located with the Cambridge Institute for Medical Research in the Wellcome Trust/MRC Building. The Institute of Metabolic Science (IMS) is dedicated to research, education, prevention and clinical care in the areas of diabetes, obesity and related metabolic and endocrine diseases. Adjacent to the Institute of Public Health, Cambridge Centre for Brain Repair is a subsidiary of the University of Cambridge Department of Clinical Neurosciences. It is a research institute aiming to "understand, and eventually to alleviate and repair damage to the brain and spinal cord which results from injury or neurodegenerative disease." The Institute for Public Health is a partnership between the University of Cambridge, the Medical Research Council and the National Health Service. It was created in 1993 to study disease in the population and to identify, evaluate and monitor public healthcare interventions. ↑ Watson-Capps, J. J.; Cech, T. R. (2014). "Academia and industry: Companies on campus". Nature. 514 (7522): 297. doi:10.1038/514297a. ↑ http://www.cambridge-biomedical.com/assets/x/50147 Archived July 8, 2011, at the Wayback Machine. ↑ "Her Majesty the Queen opens the new MRC Laboratory of Molecular Biology". Cambridge University. 23 May 2013. Retrieved 1 July 2013.